The First Amendment of the U.S. Constitution with its two clauses, the Establishment and Free Exercise Clause make up the foundation concerning the relationship of government and religion and form what is commonly called the, "religion clauses" of the First Amendment. The First Amendment as well as the other nine amendments following, which make up our Bill of Rights were ratified December 15, 1791. The Establishment Clause is a clause in the First Amendment of the constitution of the United States. This brief clause naturally leaves a great deal of room for interpretation. The clause applied only to the Federal Congress of the United States. It did not apply to the states. About half the states had state religion and state-sponsored, taxpayer-funded churches at the time the Constitution was enacted, and well into the 19th century. Disestablishment of the Massachusetts state religion did not occur until 1833. The Clause only prohibited the "Establishment of religion" — that is, for example, a law making Lutheranism the official religion of the United States. The Clause said nothing about the government acting in the realm of religion, nor anything about state-paid chaplains or teachers teaching religion. Through the secularization of the 19th century and early 20th century, the Establishment Clause came to be interpreted in a vastly different way than it was originally. The Clause was interpreted as applying to the states through the 14th amendment. The federal government could therefore regulate State actions with respect to the religion, and not only the actions of the federal government. Until the 1960s, the Establishment Clause had never been applied to the issue of creationism. The Biblical story of creation had been taught as fact and history in public (government) schools since the founding of the country, with little or no issue. With increasing secularization in the early part of the 20th century, however, evolution came to be taught to the exclusion of creationism in many public schools. Tennessee and Arkansas reacted to this by passing laws banning the teaching of evolution. Louisiana reacted by passing laws requiring that creationism be taught whenever evolution was taught. The Arkansas law was declared unconstitutional in Epperson vs. Arkansas, and the Louisiana law was declared unconstitutional in Edwards vs. Aguillard, because the court determined they unconstitutionally advanced religion. The Supreme Court has never ruled that it is unconstitutional to teach creationism or intelligent design in public schools. It has ruled that it is unconstitutional to prohibit the teaching of evolution, and unconstitutional to require creationism to be taught whenever evolution is taught. Both of these laws sought to give creationism an advantage with respect to evolutionism, but neither of them involved the simple teaching of creationism in a public school. To date, there has never been a case in which a teacher has taught creationism in a public school with the consequence that their acts have been ruled unconstitutional. Many evolutionists like to imagine that the Supreme Court has ruled that it is unconstitutional to teach creationism in public schools. Much like their belief in evolution, this belief is founded on wishful thinking, rather than evidence. Only recently have school boards in Ohio and Kansas begun an approach to creationism instruction which does not violate Establishment Clause jurisprudence, by simply adding Intelligent design to the curriculum, and removing reference to evolution from their standardized exams, respectively. It is the outcome of these cases that will determine the legal status of creationism in public schools. 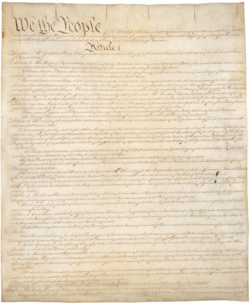 While the clause, the title, separation of church and state, is commonly associated with it, the wording does not actually exist within the U.S. Constitution. The words are instead derived from a letter written by Thomas Jefferson to a group of Connecticut ministers in 1902. Despite the present use of the phrase to bar religious influence from public funded facilities, the letter from Jefferson was issued to assure the pastors that the government would in no way interfere with them. This page was last modified on 29 April 2012, at 11:44.